Cooking is a great activity to enjoy as a family, and it helps kids learn new words as they practice cooking verbs and kitchen vocabulary. Here you’ll find games and activities to learn all about cooking. Let’s start! spread to distribute over a greater or a relatively great area of space or time Can you spread the butter on my bread? chop to cut in pieces; mince What’s the best way to chop an onion without crying? carve to cut into slices or pieces, as a roast of meat We always serve meats by carving to our customers? 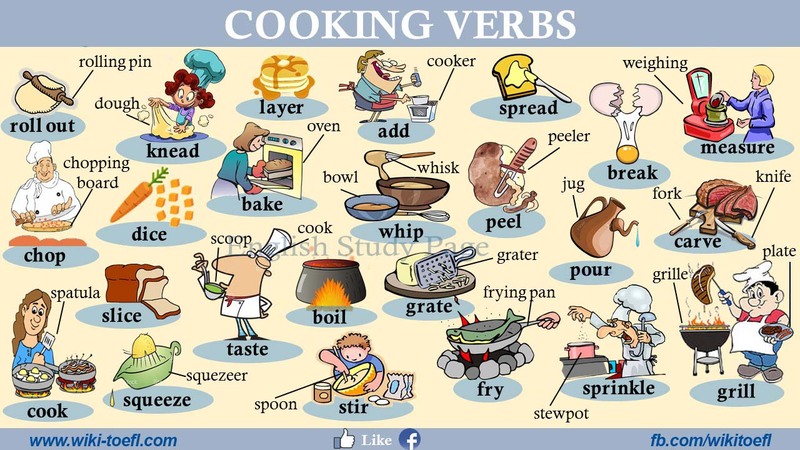 cook to prepare (food) by the use of heat, as by boiling, baking, or roasting A cook is a person who cooks. Barron’s TOEFL iBT 15th Edition by Pamela J. Sharpe Ph.D.